The Spirovent® Air Eliminator employs a patented Spirotube® coalescing medium that ”scrubs” the air from the system fluid. Simple to install with a straight in-line design it is available in the Junior Series for residential and light commercial applications from ¾” to 2” pipe size. Solid brass construction, integral patented air release mechanism and a 20 year limited warranty. Commercial units are fabricated steel and available from 2” through 36” pipe size and can handle flows to over 30,000 GPM. Custom fabrication is available for special project requirements. For large high velocity systems the ”HV” Series is available specifically for central plants and district systems where large volumes of water are being distributed. The air/water mixture enters the Spirovent and the Spirotube coalescing medium combined with a drop in velocity allows the air to break free of the flow path. All free and entrained air is removed through the integral vent mechanism along with up to 99.6% of the dissolved air. The need for frequent venting, bleeding and purging is eliminated along with air related gurgling and waterfall noises in the piping. 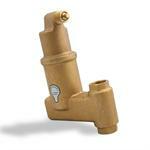 The Spirotop® Air Release Valve is essentially the vent head used on all products through 12”. It has a ½” bottom connection and can be used in places where other float vents have been used. Carries a 20 year Limited Warranty and is designed not to leak by means of a dry air chamber.